Match Report: Final round of NWASAC 2013 Personal Members Championship, Sun 20.10.13, Vale Park Bank, New Brighton (24 rods). This final round was fished into darkness in near perfect conditions over low water. With whiting plentiful on many pegs at this low water beach, anglers targeted dogfish for higher scores. John Baguley, who had a technical chance of winning the championship, managed to land five of them for the win from Zone B, while Steve Trish won Zone A for second place, scooping the golden peg cash prize in the process. Despite John’s best efforts, Bill Lindfield’s fourth place was sufficient for him to be crowned the 2013 Personal Members Champion. 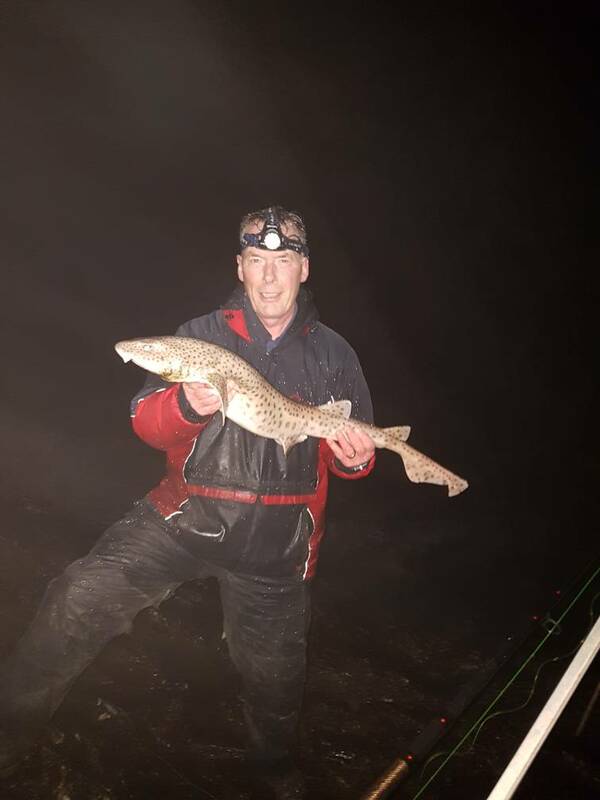 John Baguley (Wallasey), 448 points, 8 whiting, 5 dogfish, 1 codling. Steve Trish (Bootle), 427 points, 13 whiting, 4 dogfish. Joe Perry (Litherland), 353 points, 17 whiting, 2 dogfish. Bill Lindfield (Greasby), 317 points, 24 whiting, 2 dabs, 1 codling. Ian Griffiths (Eastham), 310 points, 10 whiting, 3 codling, 2 dogfish. Roundfish Pool: B. Harrison, dogfish, 94 points. Flatfish Pool: Ian Brookes (Birkenhead), dab, 9 points. John S. Williams (Prenton), 123. Pairs Championship: Waugh/ Edwards, 302 points. Liverpool University/ E.A. Mersey Cup: J. Waugh, 134 points (scored in Mersey Estuary). Nice one Bill. Great reporting Heather. Nice result Trishy, 2 matches in the same day.. bit of a task..